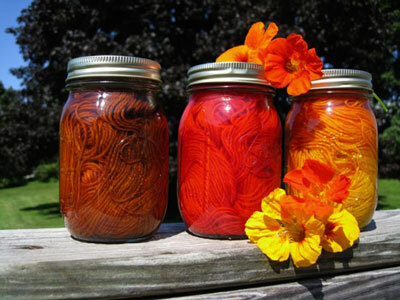 Mason jars filled with yarn and color steep in the sun’s warmth for amazing results. The success of solar dyeing depends on your geography. If you live in the tropics, the sun’s heat on a hot day may be strong enough to set the dye. If the sun’s rays are less intense where you live, you can still use this method to slowly steep skeins or balls of yarn in multiple layers of color, but you will need to steam the Mason jars afterward to ensure a permanent bond. In this demonstration, you create six tertiary colors from three primaries. You can vary this exercise by substituting another set of primary colors or by using preformulated colors. The yarn must be presoaked in an acid solution for one hour ahead of time. Use a 5-gallon plastic bucket with a lid. Add 6 tablespoons citric acid crystals and 2 teaspoons Synthrapol to 1 gallon room-temperature water (approximately 95°F/35°C). If you are working with balls of yarn, use a nylon mesh bag to keep the balls intact during the presoak. Create 4 cups (1,000ml) 1% stock solution of each color. Then mix six colors combining the three stock solutions as follows to make 3.5 ounces (100ml) of each new color. 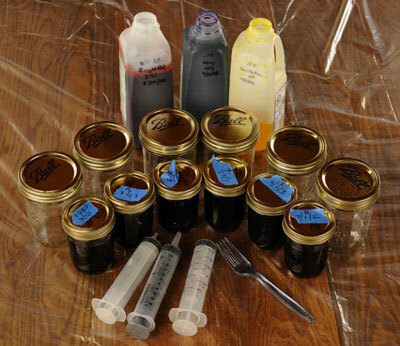 Using metric measurements makes it easier to measure small amounts of dye for the blends. Remove the balls of yarn from the acid presoak and gently squeeze to remove excess water. 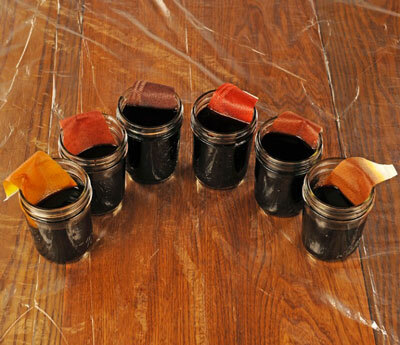 Pour 50ml of each color into a Mason jar and then add 50ml of water to make 100ml of liquid. Stir to combine dye and water. Place one ball of yarn into each jar. Cover the jar and shake well to distribute the dye color. Then place the jars outdoors on a raised surface in a hot, sunny location. This is the sun-steeping process, which is a little like brewing sun tea! Check the jars periodically. Depending on temperature, you will eventually see that the water in the jar has turned clear and the yarn has absorbed the dye. 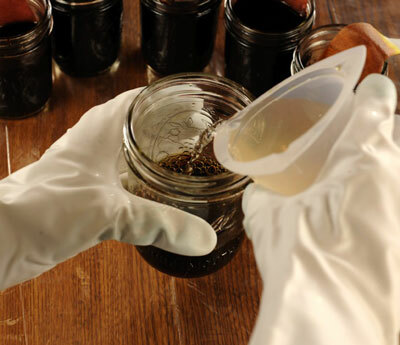 Inject a second color into the jar. Select a color that contrasts with each of the jars (for example, choose Color 2 to pair with Color 1 or Color 4 to go with Color 6). Use a syringe to add approximately 50ml of the contrasting color into the jar. 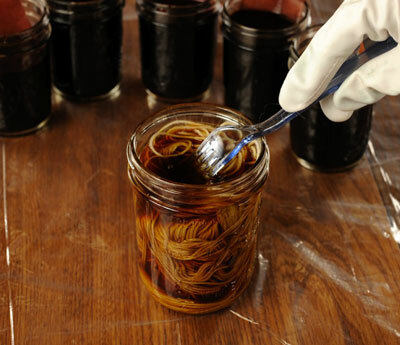 Use a plastic fork to gently lift the yarn, allowing the dye to travel down the side of the jar. 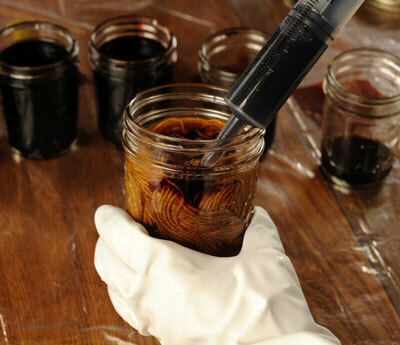 Use the syringe to draw some of the dye liquid and inject it into the center of the ball. Replace the lids on the jars and put them back in their sunny warm spot. 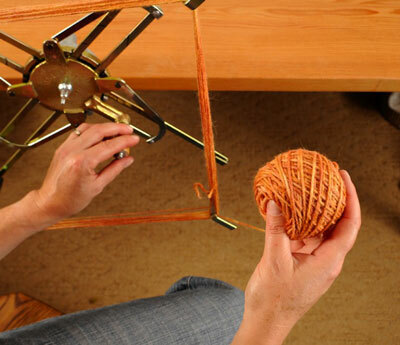 Allow them to sit for several hours without moving or disturbing the yarn. This is the second half of the steeping process. If you live in a very hot part of the globe, the sun’s heat may be sufficient to create the chemical bond between the yarn and dye. The water should be clear at the end of the process. You can check to see if the dye is color fast by washing one of the balls of yarn in warm water with Synthrapol. 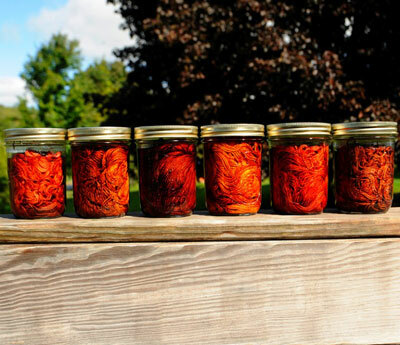 If you see any color bleeding, place the remaining jars in the canning pot and steam for 30 minutes. When the yarn has reached room temperature, place the balls back into the nylon mesh bag and rinse them in a warm bath with Synthrapol. Use a second rinse to remove the detergent suds. Press the yarn inside a towel to remove excess moisture or place the bag with yarn in the washing machine to spin out excess water. The most exciting part of the process comes when you wind the ball into the skein, to see the marble effect created by the interaction of the two contrasting dyes. This project is an interesting way to create six balls of yarn in colors that work well together in the same project. You can repeat this process using any of the WashFast or Cushing primary colors. Select a project that will juxtapose your coordinating yarn colors.